Mysterium cosmographicum : concerto for violin, orchestra & female voices (ad lib) / [music by] Larry Sitsky ; text from the writings of Johannes Kepler. 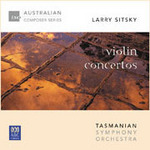 Violin concertos / Larry Sitsky ; Tasmanian Symphony Orchestra. Instrumentation: SSA choir (10.8.6), solo violin, 2 flutes (both doubling piccolo), oboe, cor anglais, clarinet, bass clarinet, bassoon, contrabassoon, 4 horns, 3 trumpets, 3 trombones, tuba, timpani, percussion (4 players), harpsichord (amplified), piano, celeste, harp, strings. Commission note: Commissioned by University of Melbourne. 28 Mar 74: Odeon Theatre, Hobart. Featuring Tasmanian Symphony Orchestra.